The most common configuration for Udocx is for the end-users to authenticate using their standard corporate (domain) credentials. Udocx then uses passthrough authentication to access Office 365, Microsoft Exchange, Microsoft SharePoint, etc., on behalf of the user. This ensures that the end-user has no more and no less access to those systems than they normally would from their desktop workstation. An alternative to this system is to use Udocx Native Login. Here, the user accounts must be pre-configured in Udocx. The credentials are stored and the end-users are authenticated by Udocx itself. You may also use Udocx Native Login with Microsoft-related Udocx Apps which override the current user credentials. For instance, you may have a 'Scan to SharePoint Folder' App which points to a SharePoint document library and has been configured to use specific credentials for write access. In this case, Service Account credentials are always used for this Udocx App regardless of how the end-user logged into the MFP and Udocx. 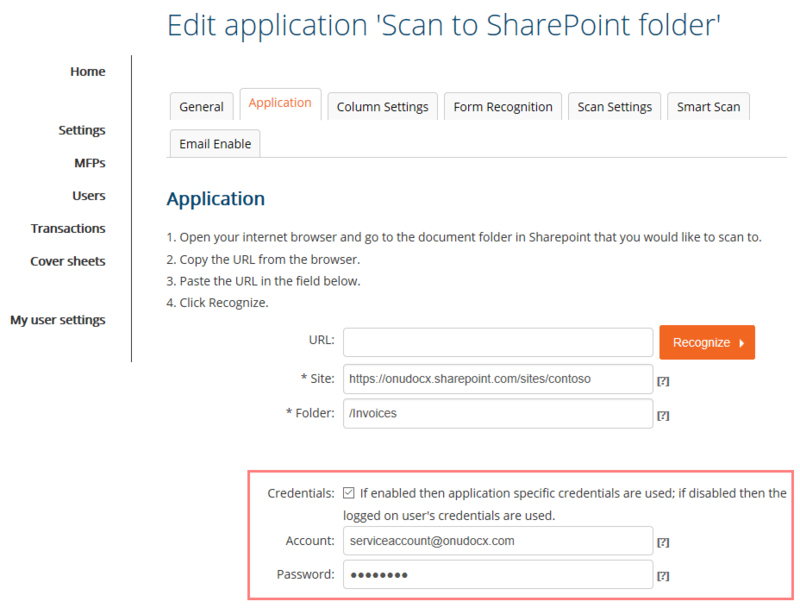 In this way, even if they used Udocx Native Login credentials to access the app, they will still be able to scan to this SharePoint folder using "application specific" credentials. Note: In most cases you will want to create a dedicated service account and use those credentials when overriding the credentials of the current user within a Udocx App. In this way it will be clear within SharePoint which files were really uploaded by "John" and which files were uploaded through a Udocx App with a service account override.